Turns out Trump and Putin had a second 'private' meeting at the G20 summit. President Trump held a second, private and "informal" meeting with Russian President Vladimir Putin during the G20 summit in Hamburg earlier this month, journalist Ian Bremmer revealed in a new interview with Bloomberg's Charlie Rose. The White House has since confirmed the existence of this second meeting, but offered no further details, NBC reports. According to Bremmer, the second meeting lasted an hour and took place during the G-20 heads of state dinner, hours after Trump sat down with Putin and his translator for a formal meeting, which Trump later tweeted about. Until now, the White House had made no mention of this second meeting, The Hill reports. 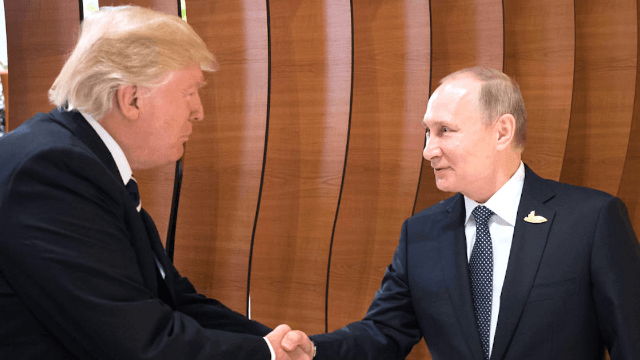 All of Trump's interactions with Putin are of course under intense scrutiny right now, given the ongoing investigations into possible collusion between Trump's campaign and the Russian government. Bremmer also commented on the nature of Trump and Putin's bromance, telling Charlie Rose that Trump's rapport with Putin during the summit was "clearly his best personal relationship" with a G-20 leader (we're not exactly surprised). Never in my life as a political scientist have I seen two countries—major countries—with a constellation of national interests that are as dissonant, while the two leaders seem to be doing everything possible to make nice and be close to each other.